Apple’s new iPhoto replacement, the Photos app, can be a little scary for some people. No more events. It looks different. Plus, what happened to the list on the left side of the screen with all of my Albums and my Library? Well, thankfully that is still there and it is easy to bring that back and a little familiarity to Photos. To bring back the sidebar go the “View” menu and click “Show Sidebar.” Instantly your list of albums, “Last Import,” etc. will appear on the left of the screen. You’ll also find projects like Books or Calendars here. If you imported an iPhoto library all of your events from iPhoto are now in a folder called “iPhoto Events.” The events have been converted to Albums, but they will all be there. 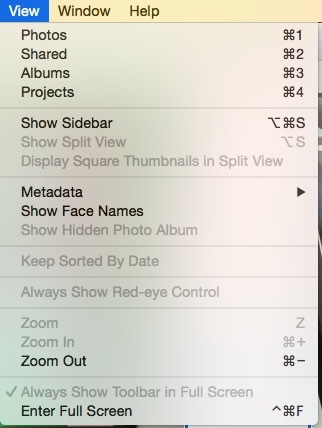 It may not be the same as iPhoto, but it will help make the transition to Photos a little easier and basic.